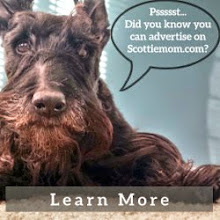 Scottie Mom: Are Scottish Terriers Good With Kids? Our scotties are not around kids much and tend to just look at them, or move behind me. However, when a baby suddently came close and kissed Macdui on the nose--three times, he just looked surprised. I have had scotties who would put up with kids, but didn't really like them. My Scottie grew up around younger children and teenagers. He likes kids and is facinated with strollers (I think he wonders why he isn't allowed to be strolled around). He plays well with children, too, even in his old age of 11. My 8 year old cousin loves playing tug and chase with him. My Scottie play well, but doesn't lunge toward the toy like he does with the adults. My Edgar does pretty well with my niece and nephew. He has had a few minor snaps to warn that he's had enough when they ignored his other signs, but is overall very tolerant, even letting my niece dress him up. We adopted Coal after a family surrendered him. He came from a home with small children and he immediately became watch dog over my infant and toddler grandnieces. The toddler would walk and grad his hair to steady herself, and he just turned his head and smiled. 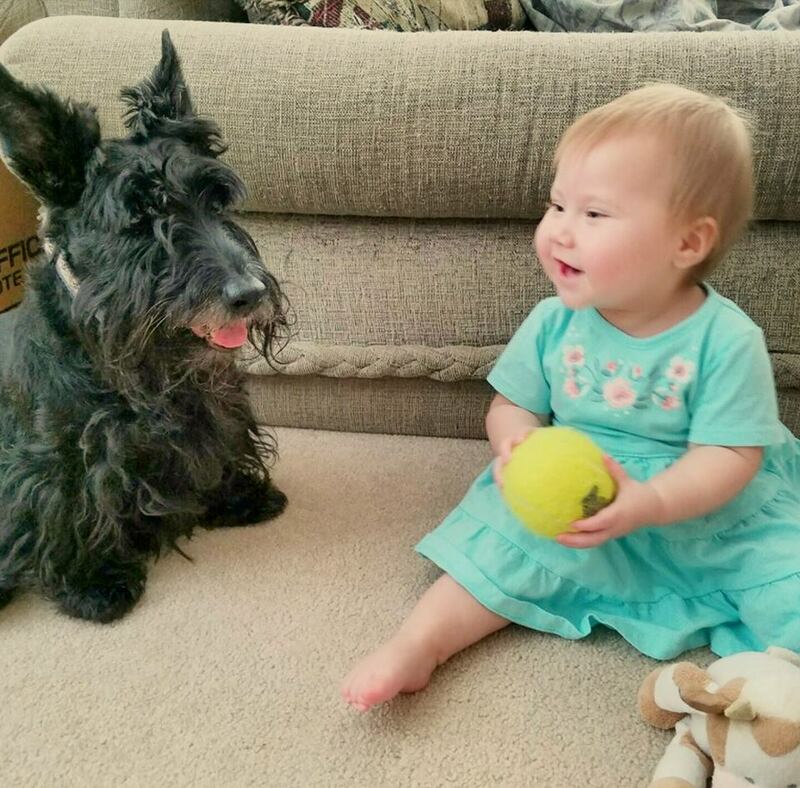 Yes, or course everyone's Scotties are different but mine loves kids. Both of ours love kids. We have a Wheaton male and a black female. They are litter mates. The breeder had young children and they can't wait to see children of all ages when they here one close by. I had a Scottie as a little girl (named Scottie because 3 year olds are very creative). He not only put up with me but with the three other babies that followed me. Honestly, I can not ever remember a gentler, kinder soul. The only time he ever so much as growled at a child was when a neighbor child was pulling on his ears. He wasn't trying to be mean, he was just trying to say "OW! That HURTS!!" Otherwise he put up with us with the patients of a saint. Everything from me trying to ride him to my little sister pushing him away and eating his food. We never got so much as a snarl from him. Rest in peace, my beloved minion. I was a little concerned when I found out I was pregnant of how Knox would deal with this new human in the house. It turns out Knox loves Liam more than anything and these two have so much fun together. Liam is now 16 months old, btw. 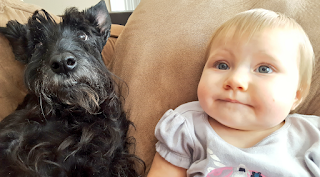 I would advise just to keep an eye on your scotties to see how they behave around the baby. Now I can say I'm pretty comfortable with these two interacting. I was really worried with mine because she was skittish around adults and doesn't like to do things kids enjoy doing with dogs (like chasing balls or playing with toys), but man was I wrong. I have a now 3yr old niece who has been around the pup since she came home from the hospital and the 2 had an instant bond. The tail wags start when we pull into the neighborhood and don't stop till we leave the house. I agree on depending on the dog. We've had our scottie Sara ever since my nephew Noah was a baby, and she has been an absolute saint. Like, he could grab her by the beard and she wouldn't make a peep! It's been the same with Noahs little brother Oliver. He may get grabby, but Sara just takes it like a champ. I have had 4 Scotties, 2 of them rescues. All have loved my grandchildren, and other nieces and nephews and their children. I have always supervised so when the children would put their faces near the Scottie's face, I would make sure the Scottie was comfortable or I removed the dog. Never had a problem. I have bred Scottish Terriers for 28 years. 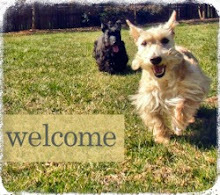 I talk with each new Scottie parents or family and explain the need to socialize their puppy. Most important is if they don't have children to be sure 2 have their puppy exposed to and interacting with kids. It will pay off from now on for just a little trouble. I agree with Lynn Wray that all small children should be taught not to put their face up to a dog's face. I tried to get across that if both puppy and child are taught to respect each other that love will follow..I have never seen a Scottie raised with kids that doesn't like kids. When bringing a new baby into the home read up on info from someone you respect on how to help your Scott accept the new family member. Your breeder should be a great source of information for the life of your Scottie . God bless you folks who rescue these sweethearts. The breeders should be ashamed for not taking these Scotties and finding them new homes!